Of all David Fincher's accomplishments as a director, he may pull off his most impressive feat of all in Gone Girl -- getting Tyler Perry nominated for an Oscar. Yes, the man who has played Madea more times than Robert De Niro has played mafiosos looks not only like a legit performer in Gone Girl, but one of the elite. Perry plays a cackling scumbag lawyer who takes it upon himself to get a smug sociopath Nick (Ben Affleck) off of charges of falsely impersonating Batman. That's no easy task, because the internet has already tried and convicted him. That difficulty level is why the movie takes two and a half hours rather than your standard two. In addition to the Bat-crime, Nick has also been fingered for murdering Gone Girl herself -- his wife, Amy (Rosamund Pike). hiding dark secrets like he once starred in Gigli. He's also unable to keep dopey smiles off his face whenever the media pokes around. Fincher plays off the did-he-or-didn't-he suspense for more than half the running time, Nick scrambles to prove his innocence to detectives, shouting cable news magazine hosts and the shouting mobs that surround his home. An underrated actor who had previously only gotten to show what he do when under the direction of Kevin Smith or Affleck himself, Affleck handles the one-man-show assignment with such vicious determination that it's feasible to imagine him being OK taking a super-serious and demanding role such as the Caped Crusader. Pike is equally searing in flashbacks and cutaways, smoldering with Affleck in their shared scenes. Also winning the day, as always, is Neil Patrick Harris, playing against type in the first serious role I can remember seeing him in. All the acting in this movie is so incredibly good that even as bladder-bustingly long as the movie is, you're left wanting more. That's Fincher's style. This is the man who delivered Fight Club, The Social Network, Zodiac and Seven. The man is so good at using his cinematic skills to manipulate emotions and minds that he could make a Mentos commercial that would make you cry and give you nightmares. In fact, maybe Gone Girl is really just that -- a Mentos commercial disguised as a crazy-long, crazy-awesome whodunnit. If so, I'm sold. Gone Girl has me willing to give Perry an Oscar, Affleck Batmobile keys and my mouth some Mentos. As filmmakers go, Fincher is one hell of a freshmaker. Starring Ben Affleck, Rosamund Pike, Neil Patrick Harris, Tyler Perry, Carrie Coone and Kim Dickens. Written by Gillian Flynn. Directed by David Fincher. 148 minutes. Rated R.
"A serious and demanding role as the Caped Crusader"? Affleck already went down that route, giving a superb performance as George Reeve in "HOLLYWOODLAND", one of the actors who portrayed Superman. let's face it. Hollywood doesn't want to take him seriously as an actor. Why? I haven't the foggiest idea. I'm beginning to suspect that the industry tends to become a poor judge when it comes to genuinely good performances. Or they're simply dumb enough to listen to movie critics, who seemed to have their own agendas. I don't know. 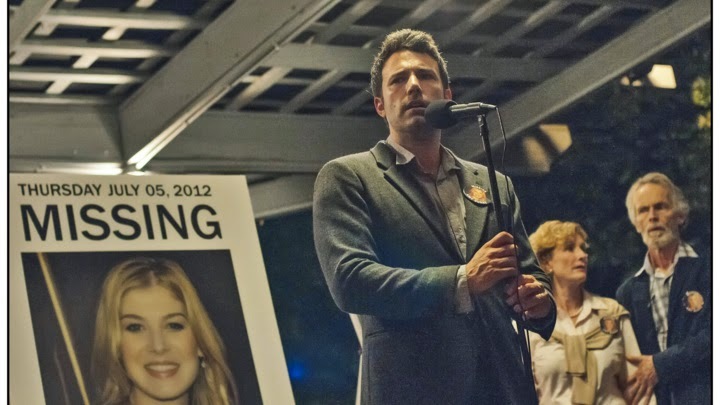 I will bet anything that Affleck will not receive an Oscar nomination for his work, whereas Rosamund Pike will. Gone Girl is out of this world, a powerful reminder of what cool, crazy, dangerous, hugely entertaining things can happen when big studios let grownup filmmakers make movies for and about grownups. This is the perfect movie for David Fincher. The intentions of the characters, good or bad, are never judged -- Fincher never takes a side. The consequences are determined by what's presented, not what's honest or even fair.